Wind and Snow | Runnin Off at the Mouth…. Yesterday we had respite from the fifty-, sixty-, and seventy-degree weather we’ve been having—it actually snowed! And it had come down pretty hard for a while there. Where I was at the time, north of Colorado Springs, we even had some accumulation. It was pretty fricking cool, pardon the pun. As I later drove down I-25, I couldn’t keep my attention away from Pikes Peak. It was—simply stated—majestic! Snow was being blown off the ridges of the Front Range and were beautifully backlit! Damn it, but I hadn’t my camera with me, so I kept hoping the majesty that was Pikes Peak would remain to some degree (again with the puns…) so I could capture it. I got home, grabbed my camera, lenses, and tripod, and rushed outside. Below are some shots I managed to capture. I used UV and polarizing filters and my 18-55mm and 70-300mm lenses. Did a couple black & white images. All files are compressed using Coral PaintShop Pro X7. 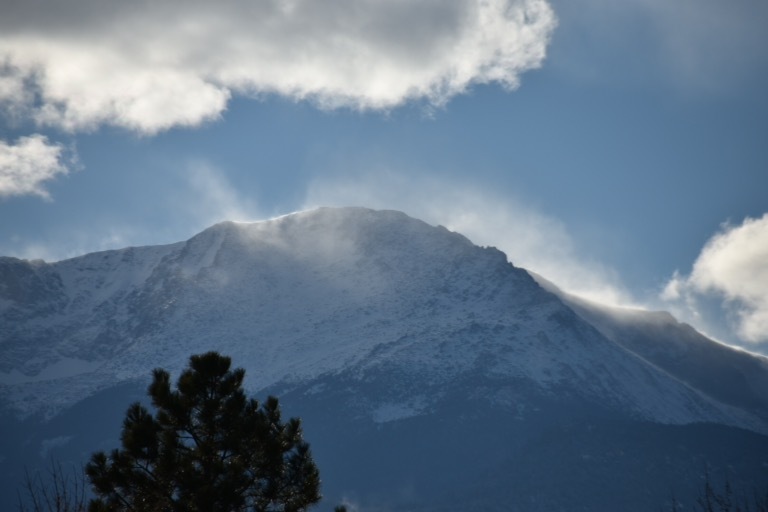 This entry was posted in Leisure, Nature, Photography, To Be Human and tagged Beauty, D3400, Mountains, Nikon, Photography, Pikes Peak, Snow. Bookmark the permalink. Those all turned out so good. My favorite is the black and white (especially the second one in the slide). Such beautiful shots, great capture! Thank you, Jill, so kind of you to say! I’m really surprised at how well those B&Ws turned out! Terrific atmosphere…reminds me of all those mountaineering books I read as a kid, picturing the wilds of Annapurna and Everest…. The blowing snow makes it seem magical. Thanks, Karen! What I captured seems to pale (another pun?!) compared to what I’d witnessed driving down I-25 yesterday. It truly looked magical how the entirety of the Pikes Peak and its range seemed to positively GLOW as the snow whipped up and over its ridges! Thanks, Paul! I’ve really been having a lot of fun getting [back] into photography…and the setting was just incredible! Pingback: The WYO Road Trip | Runnin Off at the Mouth….